We are pleased to be members of Dementia Action Alliance (DAA) and, in particular, the local groups in both Colchester and Tendring. The DAA helps organisations across England to connect, share best practice and take action on dementia. The alliance is divided into districts and each district has set their own principal aims. However, the overriding aim for all groups is to raise the awareness of dementia and to create dementia friendly communities which meet the needs of those living with dementia and their carers. Members have to commit to a series of planned actions which contribute to this goal. Read more about the plans that we have on their website here. We would encourage other local businesses and professions in the Colchester and Tendring districts to commit to the scheme. 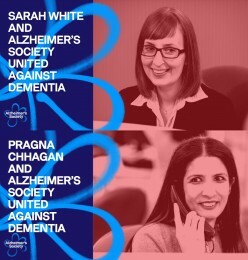 Two Solicitors in the TSP Wills and Estates team are Dementia Friends , Sarah White (Clacton) and Pragna Chhagan (Colchester) and team leader, Fiona Ashworth is a full accredited member of Solicitors for the Elderly. On Wednesday 21 February Sarah and Pragna attended the Training2Care 2018 Dementia Conference which took place at The Essex Golf & Country Club. Here Sarah reports on the conference. “The conference included a programme of speakers. We heard an inspiring and moving talk from David Lawton who has been diagnosed with dementia. David talked about the impact dementia has had on his life, including telling his nine year old daughter about the condition. Another speaker was P K Beville who invented the virtual dementia tour. P K discussed the impact that taking the virtual dementia tour has had on the care of people living with dementia. Training2Care are the only UK provider of the virtual dementia tour and the Wills and Estates team have undertaken the tour. The tour gives an insight into the physical and perceptual challenges that a person with dementia faces by using sensory tools and also through instruction from trainers. It is not only useful for those professionals providing care for people with dementia but also for family and friends. By walking in the shoes of someone with dementia you can really understand the difficulties and frustrations that they come across on a daily basis. The conference also saw the launch of the new Dementia Inclusive Virtual Tour. This is designed to be taken after the original virtual dementia tour. In this tour everything has been changed to show what a person with dementia’s life could be like if we made changes to their environment. Pragna and I were able to view the new tour bus during the conference and the Wills and Estates team hope to undertake the new tour in the near future. If you are registered disabled or physically unable to get into our office to see us then we can visit you at home, in hospital, or in care, and will not charge you for travelling to see you.